Time and time again, we come with some brilliant add-ons for every browser, and this time to we have collected this great new add-ons in the monthly collection of useful tools for your browser. Let us know which of these, you were already using and which one you can give a try. 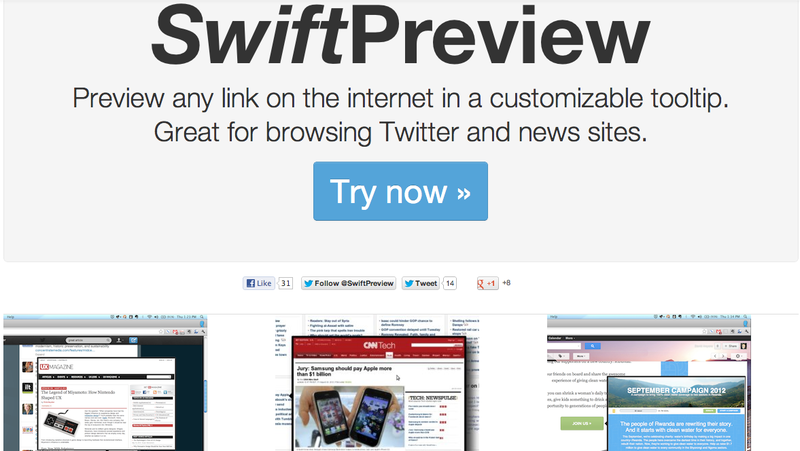 My personal favorites from the list below is the SwiftPreview. The latest version of this popular Chrome extension adds several useful new features. You can now watch YouTube Ge.tt for Twitter www.ge.tt/twitter ￼￼￼ ￼￼￼videos simply by hovering your mouse over their links; get faster and larger previews of pages without opening them; and zoom photos on Facebook and other sites. Ge.tt is one of our favourite ways to share large files online, and you can now use it to post photos, music and videos of up to 2GB ￼￼Clipboard Sync bit.ly/sync302 on Twitter. Just install the add-on (it’s also available for Firefox), then click the Attach button when you compose a tweet to upload a file. This add-on lets you sync data from your clipboard across your Google account. Copy text on one device running Chrome and you can paste it onto another. Just click the toolbar icon in both browsers to copy and paste the content. You’ll need to select ‘Sync everything’ in Chrome’s settings. It’s hard to deal with a deluge of email when you’re trying to focus on another task. This add-on lets you ‘pause’ your Gmail inbox to stop messages coming through until you’re ready to receive them. It’s particularly handy if you receive automatic notifications for new mail. Instagram has been one of the most popular apps of 2012, and this add-on brings the photo-sharing tool to Firefox (it’s already available for Chrome). You can view your feeds and images, and edit your profile, by clicking the icon in the bottom-right corner of the browser. If you use Facebook, you’ve no doubt seen ‘like spam’ in your News Feed, which appears when one of your friends ‘likes’ something online. This add-on automatically hides these annoying entries, although you’ll still see when someone ‘likes’ your own comments and posts. This fun Firefox add-on helps you improve your knowledge of geography by completing jigsaw puzzles. Choose a continent and the number of pieces (between 10 and 100), then click Shuffle to start the clock. Drag and drop the pieces into place to finish each puzzle. If you don’t like Google’s new ‘favicon’ – the small logo that appears in your address bar and bookmarks – you can use this add-on to change it back to the old one. If you weren’t keen on that either, install Google Favicon 1998 to go back even further. This geo-location add-on helps protect your privacy online by fooling websites into thinking you’re somewhere else. Go into I’m Not Here’s Preferences and either choose a pre-set place, such as New York, Paris or Timbuktu, or enter the co-ordinates of a particular location. Find out what programmes are broadcasting on BBC Radio by installing this Opera add-on. You can easily switch between 17 stations, including Radios 1 to 6, the World Service and Radio Scotland, and view the name of the current show and presenter, and the show on next.